Make small pieces of boiled potatoes. Take tomatoes, onions, garlic, ginger and mix it well in a mixture to make gravy. Take a kadai and heat oil. Add tomato gravy, garam masala, black salt, red chily powder, turmeric powder, salt and cook it for 5-7 minutes. Add potatoes and peas and let it simmer for 5-7 minutes more. If the gravy is too thick, add 1/2 cup of water. 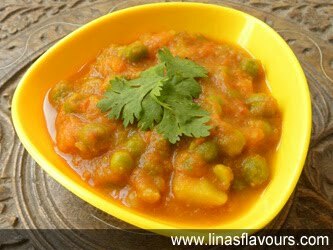 Serve it hot with rotis, parathas or rice.